Faith, Obedience, and Justification deals with sola fide in Luther, Calvin, and the Reformation tradition. Samuel E. Waldron compares the historic, orthodox Protestant position with the formulations of Fuller, Shepherd, and Garlington. This is a much-needed analysis of a very crucial subject. 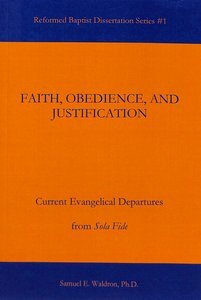 About "Faith, Obedience, and Justification"
Dr. Samuel Waldron is a prolific writer and teacher. His other books include "The End Times Made Simple."